Laura Lehmann crowned Miss World Philippines 2017 - Balita Boss! Miss World Philippines 2017 pageant coronation night was held Sunday, September 3, at the Mall of Asia Arena and introduced new sets of queen for this year. 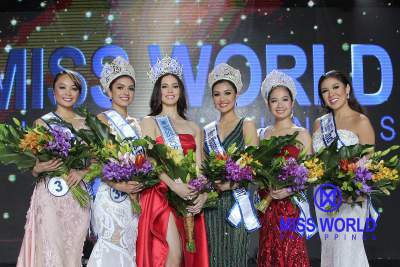 Former UAAP courtside reporter Laura Lehmann won the Miss World Philippines 2017 and was crowned by outgoing Miss World Philippines 2016 Catriona Grey and by Miss World 2016 Stephanie del Valle. Lehmann will represent our country at the Miss World competition in Sanya, China on November 18. During the question and answer round, Lehmann was asked to respond to people "who believe that pageants do not provide an opportunity to empower women." Thus, she answered: "To anyone who doesn't believe in pageants, I would ask them to take a look at the girls that we had on stage tonight. Because we had lawyers, we had architects, we had women of substance who are here to day not only because of what they look like, but also because of what's in their heart, what's in their mind, and because they brought forth 'Beauty with a Purpose' projects.They are here fighting to represent the Philippines and become the best version of a Filipina. And to me, that is something to celebrate, not protest." Meanwhile, other winning Filipina beauties were Winwyn Marquez, , won the title of Reina Hispanoamericana Filipinas 2017and will represent Philippines in Bolivia, Miss Eco Philippines, Cynthia Thomalla and Sophia Senoron was crowned as Miss Multinational Philippines, Glyssa Perez (1st Princess) and Zara Carbonell (2nd Princess). Checkout the full list of finalists and special awardees enumerated below.